Growthist corporations, their peak bodies and other similar organisations have long pushed for a big and continuously growing population in Australia. They have been crowned with success in the past ten years, but will always want more. Towards this, they are in the business of breaking down national borders and national resistance to being overcrowded. Crowding creates demand for land and products and profits for those who control resources and the means of production, whilst the rest of us pay for it. "The cows in the field will always prefer to be fewer than the farmer would want them." We are all just cash cows for the growth lobby, which can buy publicity and speakers, anointing the latter as 'experts' and cementing their grip on academic institutions and the mass media, which have become as one in their investment in property speculation and population growth. Prominent in the growth lobby, the Committee for Economic Development in Australia, CEDA, is advertising yet another population growth-pushing event: "Migration - the economic debate." This will examine "How the migration program could be reshaped to allow a larger migrant intake to build a greater Australia, How temporary migration has grown to dominate immigration to Australia; and What changes are required to the migration program to maintain broad community support." The Australian Productivity Commission recently failed to find any evidence of migration increasing wealth or productivity,  so it will be interesting to see what economic excuses CEDA manages to concoct as reasons to push for even more people. It is also more and more obvious that Australians are waking up to the costs of mass immigration. 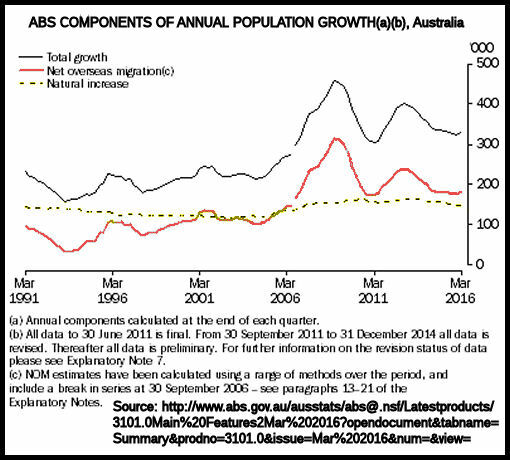 Although Australia has the highest immigration rates ever for permanent invited economic immigrants and various other 'temporary' immigrants, (see ABS-sourced graph below) the industries and individuals that benefit from rapid population growth want even more. One gets the impression that they really have no more interest in democratic or ecological limits than a machine that has no off-switch. Since I identified the growth lobby in my research thesis of 2002, I have been aware that this lobby is organising at a global level, gaining more and more power. The CEDA conference is funded by "Fragomen Worldwide": "We build bridges that transcend borders. Learn why and how we do it." "Fragomen, Del Rey, Bernsen & Loewy, LLP provides immigration services globally in coordination with its affiliates around the world." In 2008 Americans were trying to stop this jugganaut. The fact that they did not may be why today so many Americans want to elect Mr Trump, who promises to put some brakes on the import of cheap labour. Lou Dobbs: 6/24/2008 The federal government is doing an investigation of the biggest immigration law firm -- Fragomen, Del Rey, Bernsen & Loewy. Apparently the lawyers have been giving too much coaching to employers on how not to hire qualified Americans. David Huber shows how a job resume he sent to Cisco was reviewed by Fragomen, who coached Cisco on how ignore resumes of Americans in favor of foreign workers on H-1B and green card (PERM) visas. How did Australians lose so much control over their immigration program? Open-borders propaganda: In Australia ordinary environmentalists have seen a rising resistance to the protection of our natural environment from the very people they thought we could rely on – The Australian Greens and various big environmental NGOs. Among spokespeople for the Greens, this resistance has manifested as a militant effort to support Lib/Lab policy of massive population growth through planned and commercial immigration by confusing refugees with ordinary immigrants, and calling any attempt to reign in immigration racist. As for the big environmental NGOs, they have become afraid to talk about population growth for fear of being politically stigmatised. Environmental debate on diverse issues has largely been taken over with top-down climate focus. In national policy, a focus on minority groups dominates what we all have in common. Behind this creeping confusion the hacking of multi-billionaire George Soros’s files has recently shown him to be behind the new-age ideology of open borders. Through Open Societies Foundations and a legion of other NGOs, he funds minority causes and flagging political parties as flag-bearers for his ideology. In Australia he has funded various pseudo-socialist groups, and members of the Greens and GetUp, which have cross-pollinated each other and also have links in the ALP, via Bill Shorten. See "Australian democracy swiss-cheesed by George Soros Open Societies Foundations". And that is only the first layer of his influence here. What motivates George Soros, the multibillionaire, to prosecute open borders? See "Population stampedes: Why does Soros push open borders?". A remark attributed to French economist and demographer, Alfred Sauvy, who did indeed write about lean cows and fat cows, although this exact remark remains a rumour. The material below cites the Productivity Commission, Economic Impacts of Migration and Population Growth, Position Paper, January, Melbourne, 2006, and on Productivity Commission, Population and migration: understanding the numbers, Melbourne, 2010 (December). Direct quotes are in quote marks. “Most of the economic benefits associated with an increase in skilled migration accrues to the immigrants themselves. For existing residents, capital owners receive additional income, with owners of capital in those sectors experiencing the largest output gains enjoying the largest gains in capital income. On the other hand, the real average annual incomes of existing resident workers grows more slowly than in the base-case, as additional immigrants place downward pressure on real wages. "The economic impact of skilled migration is small when compared with other drivers of productivity and income per capita. For example, over the same period, growth in income per capita from technological progress and other sources of productivity growth, and long-term demographic changes, could be expected to be about 1.5 per cent per year, or $14 434, by 2024-25 (Commission estimates). o While population growth is likely to increase aggregate gross domestic product (GDP) and gross national income (GNI), more relevant measures are per capita income and, ultimately, community wellbeing. o The impacts of immigration growth on GDP and GNI per head of the existing resident population are ambiguous and depend on the source, composition and context in which the growth occurred. o Population growth and immigration (its main source) can magnify existing policy problems and amplify pressures on 'unpriced' entities, such as the environment, and urban and social amenity. "The impacts of population growth on productivity are also complex and, in many instances, depend on the sources of that growth and the context in which it occurs. There could be some negative impacts on labour productivity, for example, due to the dilution of available capital across a greater number of workers.